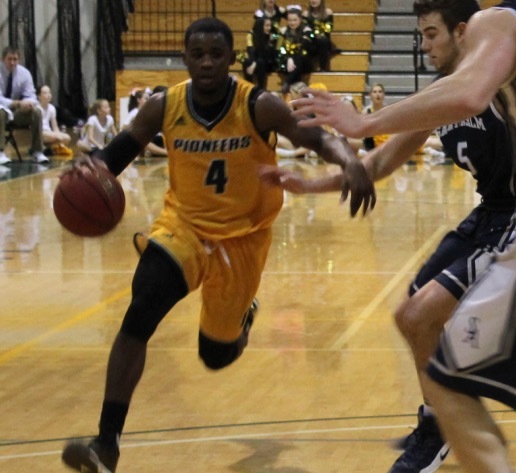 The Pioneers lost their fourth straight game Saturday after Saint Anselm College rose to a 87-81 lead in overtime at the Pratt Recreation Center. Senior Forward Greg Dotson led the home team in total rebounds and total points with 9 and 26 respectively, and Senior Guard Jared Hall led the team in assists with ten. The Pioneers started strong, leading the Saint Anselm Hawks 15-9 within the first four minutes of the game, but he lead for the rest of the first half would be a tug of war between the two teams. At the half, the Pioneers came out one top with a small four-point lead. The majority of the second half was dominated by the Pioneers. A 6-0 run by the Pioneers brought them to their largest lead of 13 points with 11:22 left in the game. It seemed as though the Hawks just couldn’t miss, and they quickly chipped away at the Pioneers lead during the last four minutes of the second half. It was a three pointer by Saint Anselm sophomore Tim Guers that brought the Hawks to a one point lead over the Pioneers with just one minute left in the game. A clutch free throw by Red Shirt Junior Guard Aary Bibens tied the game with one second left on the clock, causing the game to overtime. The Hawks dominated the first few minutes of overtime with a 5-0 run over the Pioneers. A steal by Hawks Senior Forward Chris Braley sealed the deal with the Hawks up by six. Coach Erik Smiles and the Pioneers now hold a record of 5-14 and will return to the court January 25 when they take on Daemen Amherst, NY at 6pm.